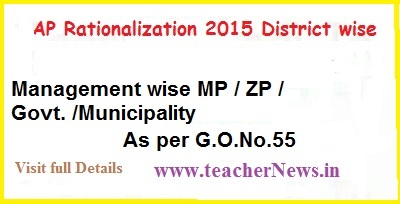 Andra Pradesh Rationalization 2015 Disrtict wise and Management wise ( MP/ZP/Govt./ Municipality ) Primary / UP / High Scools. 1.One Class-One Teacher" norm for Primary classes where enrollment is at least 100 students. This norm is recommended to facilitate positive consolidation and to enhance scope for improved learning levels for the students.2. Ensure positive consolidation of schools With <30 enrollment and within 1 km. radius in the same GP/Municipality so as to make schools viable . 3.Attach/open an ECE Center for every Model Primary School.4.Aadhaar based Chlldlnfo data and not UDISE data should be the basis for School & Teacher Rationalization.